The Martian moon Phobos shines faintly in a dusky sky, as seen by NASA's Curiosity rover. A fresh picture from NASA's Curiosity rover shows the Martian moon Phobos as it's never been seen before — as a crescent shining over the Red Planet at dusk. The image was captured by the rover's Mastcam imaging system last Friday, on the 45th Martian day of Curiosity's mission. You have to look closely to make out the faint, somewhat irregular crescent in the frame — just as you sometimes have to look closely to see our own moon's ghostly crescent in Earth's daytime skies. We've seen other views of Phobos, the larger of Mars' two moons. But those mostly show the moon as seen by Red Planet orbiters, or as a silhouette during an eclipse. This is a rare photo (perhaps the first?) showing a crescent moon in a daylit Martian sky, as seen from the surface. It's the sort of spectacle that settlers could look forward to at sunset, decades from now. The Planetary Society's Emily Lakdawalla provides further detail in her blog posting, plus further reflection: "Think about this for a moment — we're seeing a different moon from the surface of a different world. And this moon is weird not just for its lumpiness, but also because it orbits so close to Mars that it outpaces Mars' rotation. That means it rises in the west and sets in the east, more than twice every Martian day. Completely alien. And awesome, in the literal sense of the world." More awesomeness may be on the way on Thursday, when NASA has scheduled a televised news conference about the latest scientific findings from the $2.5 billion Curiosity mission. There are already reports that the rover has detected concrete-like material that hints at the past presence of water. That meshes with Curiosity's mission to trace the geological history of the Red Planet, and look for chemical evidence that Mars was once potentially habitable. What else will we find out? Stay tuned for Thursday's update. In the meantime, check out the pictures that are flooding through NASA's Mars Science Laboratory website and the MSL forum at UnmannedSpaceflight.com. Here are a couple of nice panoramas from Ken Kremer and Marco Di Lorenzo. One image is based on colorized imagery from Sol 29 (Sept. 4), and highlights the instrument-equipped turret on the rover's robotic arm. 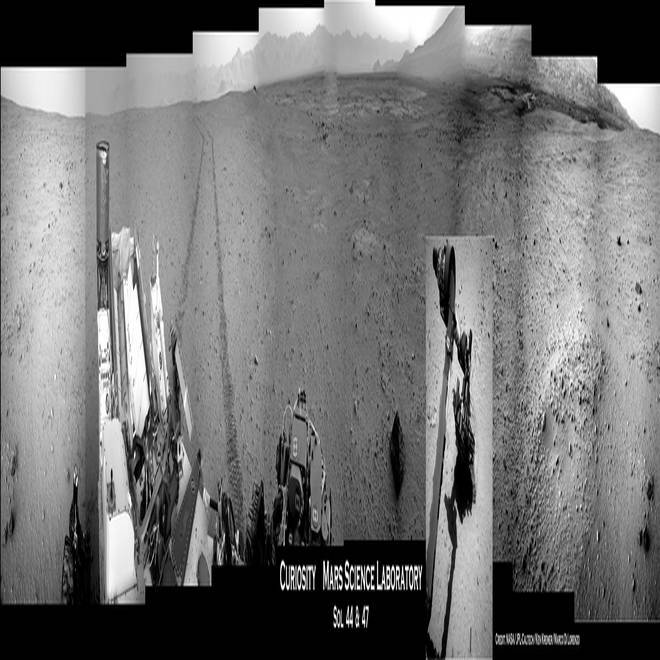 The black-and-white photo was assembled from data collected on Sol 44-47 (Sept. 20-23). In that 360-degree photo, the rock known as Jake Matijevic is just right of center stage. An inset photo shows Curiosity placing its robotic-arm turret on the rock. A panoramic mosaic of Curiosity images from Sept. 4 shows the rover and its surroundings. Click on the image for a higher-resolution view. A 360-degree panorama, stitched together from Curiosity images, shows the rover and its surroundings in the Sept. 20-23 time frame. Curiosity conducted its first contact-science experiments on a rock designated Jake Matijevic, which was named after a recently deceased member of the rover team at NASA's Jet Propulsion Laboratory. 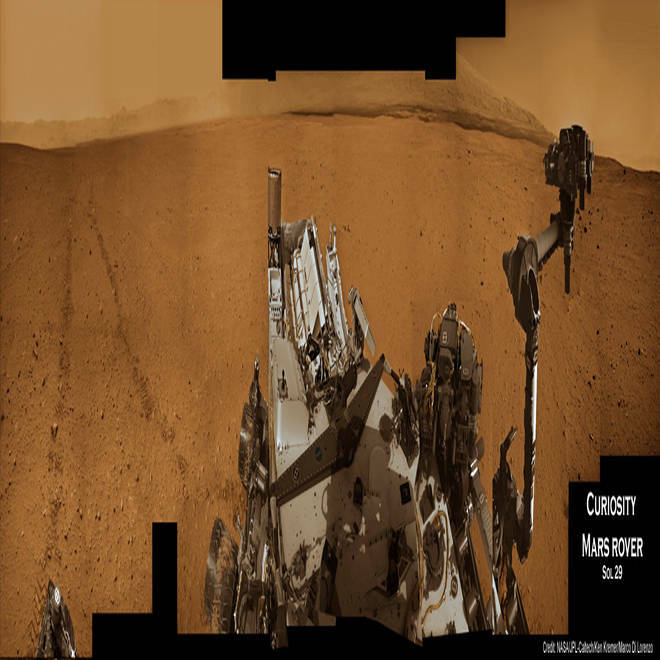 The overall panorama shows the rock named Jake just right of center, and an inset photograph shows the rover's instrument turret examining the rock. Click on the image to see a higher-resolution version.